The year 2017 marks both the 100th anniversary of the formation of the National Hockey League and the 125th anniversary of the commissioning of the Stanley Cup. To highlight these events, the Dictionary of Canadian Biography/Dictionnaire biographique du Canada (DCB/DBC) has put together this thematic collection. The biographies concern not only hockey, Canada’s national sport par excellence, but also more than 50 other sports. They present an overview of the development of sports, their practice by Canadians, and the sporting achievements that have left their mark on the collective imagination. We begin with New France, where settlers and governing authorities had to make great efforts to ensure that their colony would survive and flourish. Nevertheless, sports were a regular feature of daily life in the 16th, 17th, and 18th centuries and provided opportunities to demonstrate speed, agility, and strength, all qualities that were valued at a time when land was being acquired and furs were being sought. Certain sports practised by aboriginal peoples, such as lacrosse and snowshoe racing, were among those adopted by the newcomers. Following the conquest of 1759, activities that were part of the sporting tradition of the British and Irish Isles, and particularly of Scotland, such as golf and curling, were introduced. Sport was a significant cultural identifier during this period as well as in the 19th and 20th centuries. Engaging in sporting activities, and especially those requiring time and money, such as equestrian sports, cricket, yachting, and recreational hunting and fishing, was a means by which members of the middle and upper classes could display their social status. Demonstrating their position in society was also a motive for those who were involved in organizing or managing a club or a league and gave financial support to the establishment of gymnasiums, fishing lodges, and other sports infrastructure. These clubs and leagues took shape following the slow process of creating structural frameworks for sports during the 19th century, and they became a necessity as participation in sports increased. Organized sports first appeared in Montreal, the country’s metropolis at the time. The founding, in 1807, of the Montreal Curling Club by a group of Scots that included Thomas Blackwood, George Garden, and Alexander Skakel was an early example of this trend. The creation of local associations gradually led to the formation of provincial and national groups, and then to the codification and harmonization of the rules of several sports previously characterized by varying degrees of regional difference. Essentially, organized sport was achieved by people with the time and means – aristocrats, the bourgeois, military officers, and other members of the middle and upper classes – to undertake the work. Such groups allowed them to socialize and to develop their sport while controlling access to it. The socio-economic, racial, and ethnic segregation [see George Godfrey] that characterized a number of sports became less pronounced from the third quarter of the 19th century onwards thanks to increased salaries and a reduction in the number of hours worked by members of the lower classes. These changes fostered greater participation in sport and contributed to the rise of professional sport. Many people from humble backgrounds, such as the famous Canadian rower Edward Hanlan, could now earn an income from their performances – which were followed by an ever-larger number of people – and sometimes make a living from them. Several members of the middle and upper classes considered the remuneration of athletes a betrayal of the amateur-sport ideal of pushing the limits for their own sake. They also looked unfavourably upon the growing presence of members of the lower classes in sports, fearing, for example, that an ordinary fisherman such as Hanlan could outclass gentlemen in the sport of rowing. They therefore attempted, without much success, to limit the growth of professional sport and delay the democratization of sport by imposing sanctions on salaried athletes who were members of an amateur association; they also restricted access to clubs, leagues, and competitions. Tensions between supporters of amateur sport and professional sport culminated in 1906: the split within the national amateur sport management organization, the Canadian Amateur Athletic Union, is recounted in the biography of its secretary Norton Hervey Crow, who was at the centre of the “amateur wars” (1906–09). In addition, sport was a means for the expression of manliness. Strength, endurance, even the courage to pit oneself against an adversary in hockey and lacrosse matches – sports that, particularly in the 19th and early 20th centuries, were marked by violence – were hallmarks of character. The cultivation of these qualities in young men, and their expression at any age, were valued. For a long time sport was almost exclusively a male preserve. Most of the time women, considered to be fragile creatures disinclined to compete, and hampered by clothing unsuitable for playing sports, were relegated to the role of spectators, or chosen to present medals. Women’s sports, nevertheless, developed from the mid 19th century, initially among the middle and upper classes. As was the case with men’s sports, the rise in sporting activities led to the creation of women’s regional, provincial, and national organizations as well as participation in international competitions [see Velma Agnes Springstead]. Women’s integration into sports where toughness was required (such as hockey, lacrosse, and boxing) came later. The prevailing perception that women were delicate – a perception reinforced, with some exceptions [see Helen Letitia Mooney], by physical-education programs in schools and by aboriginal residential institutions [see Joseph Hugonard] – meant that progress remained slow. Some businessmen, politicians, and governors general of Canada donated trophies to Canadian sports to reward excellence and encourage participation. The most famous of these trophies is still the Stanley Cup, commissioned in 1892 for the country’s best amateur hockey team. A gift from Governor General Frederick Arthur Stanley, 1st Baron Stanley, it was awarded for the first time on 9 March 1893 to the Montreal Amateur Athletic Association. As well, the Minto Cup for lacrosse and the Grey Cup for football, created respectively in 1901 and 1909 and donated by Gilbert John Murray-Kynynmound Elliot, 4th Earl of Minto, and Albert Henry George Grey, 4th Earl Grey, also acquired the status of Canadian sport symbols. In addition, athletes who excelled in their disciplines, such as the Montreal Canadiens’ goalie Georges Vézina, gave their names to trophies created in their honour. Proponents of moral and social reform in the 19th and 20th centuries also played a significant role in the promotion of sport and the democratization of its practice. Anxious to improve morals and counter what they considered the negative effects of urbanization and industrialization, they worked to improve the physical and moral health of Canadians by, for example, combating alcohol consumption, encouraging participation in sports, and setting up physical-education programs in schools. People such as James Armstrong Richardson and Henri-Thomas Scott encouraged the creation of playgrounds, track and field venues, gymnasiums, skating rinks, and swimming pools to make sports accessible to the greatest number of people. Others, such as John Rudolphus Booth, founded organizations dedicated to the healthy development of body and mind, of which the Young Men's and the Young Women's Christian Associations are good examples. Some aboriginal leaders who sought to improve the living conditions of their people, such as Onistah-Sokaksin, also urged those under their protection to take part in sport and physical exercise. Besides fostering these initiatives, the reformers condemned sports betting, which was believed to encourage greed and impoverish households [see George Elias Tuckett]. The popularity of betting rose significantly in the third quarter of the 19th century with the proliferation of leagues and competitions and the increase of sports coverage in the press. The development of transportation infrastructure contributed to the rapid increase in the number of regional, provincial, national, and international leagues and competitions, where several aboriginals such as the Blackfoot Api-kai-ees and the Cree Alexander DeCoteau distinguished themselves; the latter participated in the Olympic Games in 1912. The growing amount of space devoted to sports in the newspapers, and the rise of sports journalism, both well described in the career of John Prescott Wilshere Good, also illustrate the impact of 19th-century technological innovation on sport. Improvements in means of communications such as railway and telegraph networks and printing processes allowed better coverage of events and faster transmission of results. The rising status of sports journalism reflected and reinforced the popularity of sport in Canada. After 1867 sporting achievements in this country and abroad contributed to the gradual emergence of a national Canadian identity. In the summer of that year, following confederation, the victories of Samuel Hutton and his team-mates, better known as the Paris crew, at the regattas held during the universal exposition in Paris aroused pride and enthusiasm. Canadian accomplishments at the Olympic Games, the Commonwealth Games (first held in 1930, in Hamilton, Ont., under the name of the British Empire Games), and the Canada Games (established in 1967 to mark the country’s centenary and organized for the first time in Quebec City) had a similar impact over the course of the following decades. Countrywide participation in certain sports also stimulated the growth of a national identity. Among them were lacrosse and, in particular, hockey, which acquired the title of “the national sport” in the early decades of the 20th century. Two sections of “Sports” are devoted to hockey. The first brings together biographies describing the evolution of the game and the organization of the sport; the second features important figures of the hockey world. 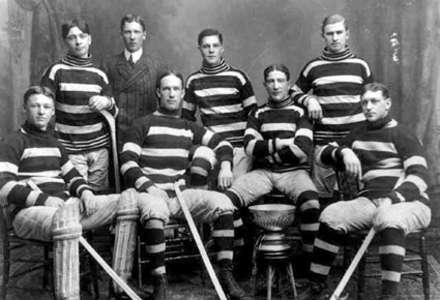 Also included are the fathers of the game, such as James George Aylwin Creighton; amateur players, such as John Bernard Brophy; and professional players such as Howard William Morenz, Maurice (the Rocket) Richard, and Georges Vézina, who left their mark on the history of the National Hockey League, formed in Montreal on 26 Nov. 1917; and players, coaches, and owners who took part, with varying success, in the Stanley Cup finals. Another five sections bring together biographies dealing with more than 50 other sports. The first covers winter sports, such as curling, skating, snowshoeing, and skiing. Winter activities quickly became very popular in towns and rural areas. The section on summer and indoor sports gathers together biographies that involve sports associated with warmer weather, such as baseball; those sports practised both outside and inside, such as gymnastics and athletics (grouped under this description are the activities related to running, jumping, and throwing); and those practised only indoors, such as billiards. Biographies involving boxing, fencing, wrestling, and judo are collected under “Combat Sports,” while those that deal with sports such as rowing, canoeing, swimming, and yachting, are in the water sports section. Disciplines associated with horseback riding and car racing, the development of which was linked to the growth and improvement of the road network in the 20th century [see Albert Edward Todd], are found in biographies placed in the “Equestrian and Motor Sports” section. Every new relevant biography published by the DCB/DBC will be integrated into the whole, which will expand the range of sports and the number of athletes covered by this thematic ensemble.